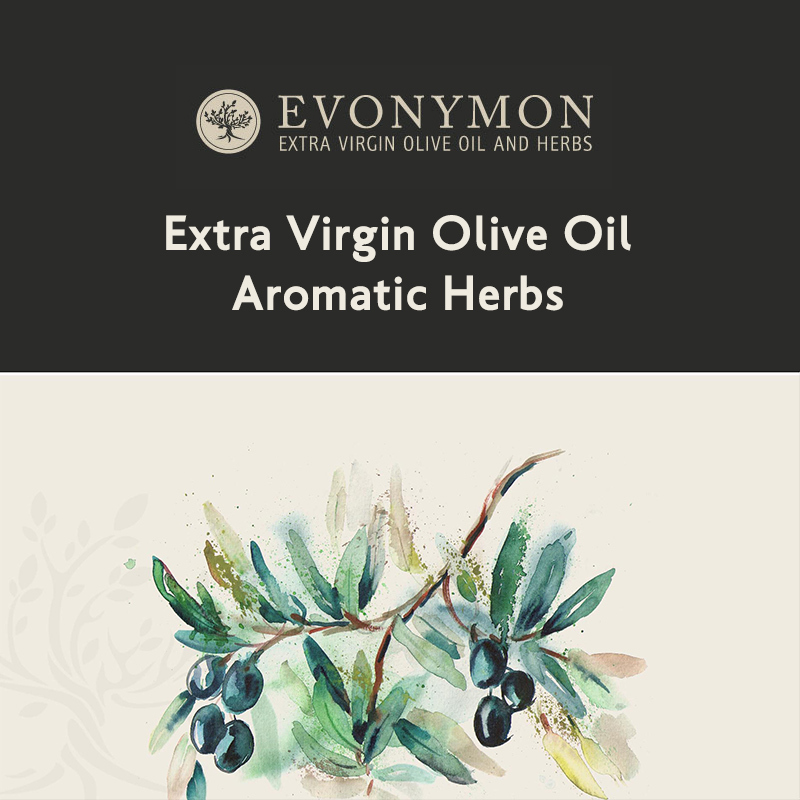 Based in Varakes of Messinia, “Evonymon” company produces authentic greek products, such as extra virgin olive oil and aromatic herbs by people who cherish nature and respect traditional Greek agriculture. The Mediterranean climate of the region favours cultivation of the Koroneiki olive tree variety. The diversity of the landscape, with valleys and hills, creates microclimates that yield olive oils with different characteristics. Trees are usually not watered, which yields olives with very high concentrations of antioxidants. Moreover, the high temperatures usually observed at low altitudes contribute to the formation of high phenolic load, i.e. the formation of antioxidants (Kyritsakis 2007). The importance of each step, from cultivation and harvest to crushing, bottling and preservation, aims to maintain the pharmaceutical and nutritional properties of the extra virgin olive oil. This requires special handling during all stages of production. Extra virgin olive oil is produced by 100% Koroneiki variety of olives, cold extracted within a few hours from harvest. Cold extraction results in extra virgin olive oil that preserves its beneficial nutritional attributes. By shortening the holding time between harvest and extraction, deterioration of the olives, which starts at the moment they are removed from the tree, is minimized. The company aims to change any erroneous traditional techniques, apply good agricultural procedures (GAP) and continuously improve all the route of the product, from the tree to the bottle. The company founders Stavroula Rozou (pharmacist MSc, PhD in Pharmaceutical Analysis) and Nick Krikelis (Chemist, MSc in Analytical Chemistry and Instrumentation) have a scientific background that was fundamental in the evaluation and appreciation of the parameters that affect the quality of olive oil. The company, also, produces greek aromatic herbs, such as oregano, spearmint, rosemary, bay laurel leaves, marioram, basil, peppermint, greek sage and lemon verbena. The herbs are picked by hand, washed, dried stored in appropriate environment using dehumidifier and are packed in tin cans, which are safe and can maintain their aroma for a long time. Calibrating Panelists’ Minds and Palates, Olive Oil Taste Laboratory of Τ.Ε.Ι. Kalamata. Olive oil seminars.com: “Olive trees pruning: Targets, Criteria and Techniques” by Riccardo Gucci professor of the University of Pisa.